Desert Vista RV Resort is very clean. Most who stay here are long term stays in motorhomes or 5th Wheels. My daily rate is based on a 3 month stay. Like most parks, the longer you stay, the less per night cost! Camp sites are concrete pads and patios. Camp sites are wide and will accommodate a 40′ RV. All are back-in sites. There are some permanent, park models in the park, but most sites are available for RV’s. A common space is available for meetings, gatherings for games, a tennis table and pool table are located there as well. A small, workout room with a treadmill, an elliptical machine and a stationary, cable weight machine is available there too. A large screen TV is located in the workout room. A small kitchen and refrigerator is also available for use in the common room. Desert Vista RV Resort is gated and requires a code to enter. A garage door opener is available at a fee of $50 which is returned when the opener is returned to the office. Camp sites have FHU, water, 50/30A service and cable (which is contracted through Cox Cable, not the park). Not aware of free WiFi because I have Cox data and video during my stay here for the three months of January thru March of 2017. OTA TV is easily available with your RV antenna. There are many restaurants and other eateries, grocery and department store shopping and theaters close by. The campground is close to Phoenix via highways. A trolley system is available with access from Mesa to all venues downtown Phoenix. Finally, there is a small, heated pool and a hot tub. Penny is the office manager and is very pleasant. She will accommodate you as much as possible. Overall, a very nice, long-term stay park or for a few nights. 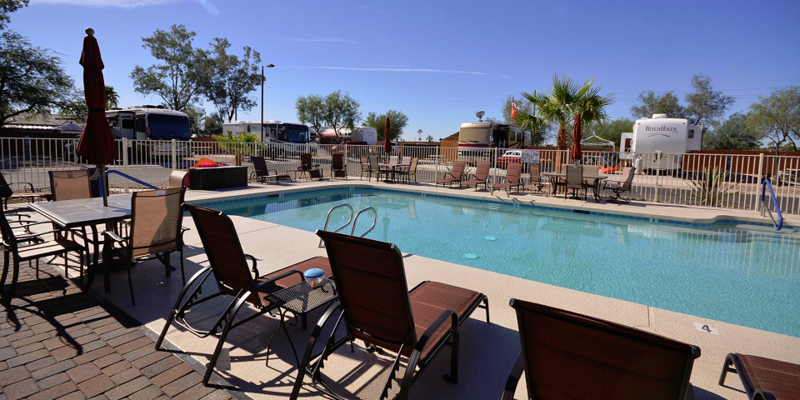 Desert Vista RV Resort is a hidden gem among all of the RV parks located in the Mesa area!